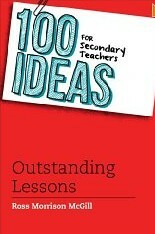 I have a couple of copies of the new book ‘100 ideas for secondary teachers’ by @Teachertoolkit. The book is divided into a range of chapters including progress, planning, assessment, behaviour and homework. There are a few ideas we should all be familiar and regularly use (e.g. ‘pose, pause, pounce and bounce) but many more that you may not have come across. If you try any of the ideas from the book, it would be great if you could share your thoughts with the rest of the staff here or in your LTC.